The first night we moved to our home in Livermore, I asked Tom if he would mind getting me a lemon. He looked perplexed. Did I really want him to go to the store to get just one lemon? And then it dawned on him what I meant—would he please pick one from the tree in our front yard. I remember seeing an old movie, it might have been a silent one, where a hand reached out of a window to pick an orange hanging from the tree right next to the house. California. A paradise where oranges were in such abundance, you didn’t have to wait until Christmas to receive one in your stocking. All you had to do was reach out your window and one would jump into your hand. That’s what that moment, the first night in Livermore, felt like to me. It has been quite a journey, my return to Livermore. For Tom as well, I think. A paradise and a hell. The best and worst things in my life happened to me here—when I was a child, and then again when I returned. I’ve asked myself, why? Why were there such extreme experiences and why did I return here? On the surface it was family matters that drew us back. Tom’s dad and my mother were nearing the end of their lives. We came to care for them and ended up bearing witness to the waning of their lives. There were many other losses we experienced while living here. Our cat Rug, Dominic’s wife. Doug’s wife. George. Marge. Ed. There were triumphs. Tom’s commissions to write orchestral pieces. Fourth Street Studio and the Saturday Salons. Publishing five anthologies of the writing from people who came to the Salons. Productions of spoken words. Tom and I returned to acting. I directed my first two plays. And then there were the painful obstacles. An arts community that was driven by the fear that there was not enough to go around—not enough talent, not enough acclaim, not enough enough. It created a competitive environment that was not based on striving for excellence, but rather battling over who would be in control, who would be the anointer. I was always on the other side of this competition. Or rather, I was outside of it, never giving it credence, plugging along doing my work, producing events, publishing anthologies without waiting to be anointed. I was surprised at the viciousness of the response to my successes. It became enervating, being the outsider. I sought community. It tweaked all my childish, festering wounds—all based on the question, why aren’t I acceptable? What’s wrong with me? The big lesson for me in all of this was that being acceptable was not my story. My story is about being authentic. A writer’s voice, after all, must be authentic if she is to rise to Faulkner’s challenge issued in his Nobel prize speech: create from the materials of the human spirit, that which did not exist before. We were told in our Hospice volunteer training that our job was to bear witness. We weren’t there to help, heal, cure, cheer up, or fix. We were there to bear witness to a life. I like that: bearing witness. I think that might be why I was called to return to a place that holds such extreme experiences for me. It was the opportunity to bear witness to my own life. To see the story I thought I was supposed to be living, and find the one that was mine. To begin to live that story. When life gives you lemons, make lemonade the adage goes. But there is so much more you can do with lemons. Lemon meringue pie. Lemon sorbet. Lemon curd, Lemon juice in your salad dressing. Lemon juice squeezed over your fish, pork roast, roasted chicken. Lemon and honey and fresh ginger in hot water to soothe a sore throat. Lemon peel twisted, the oil from its rind circling the rim of the martini glass. Lemon zest added to—well to just about anything. Life gives you the lemons. You get to decide what to do with them. The trunk of Gene’s lemon tree is gnarly, the gnarl that comes with age. Lumps and bumps formed to heal wounds. A rod inserted to hold split halves together. 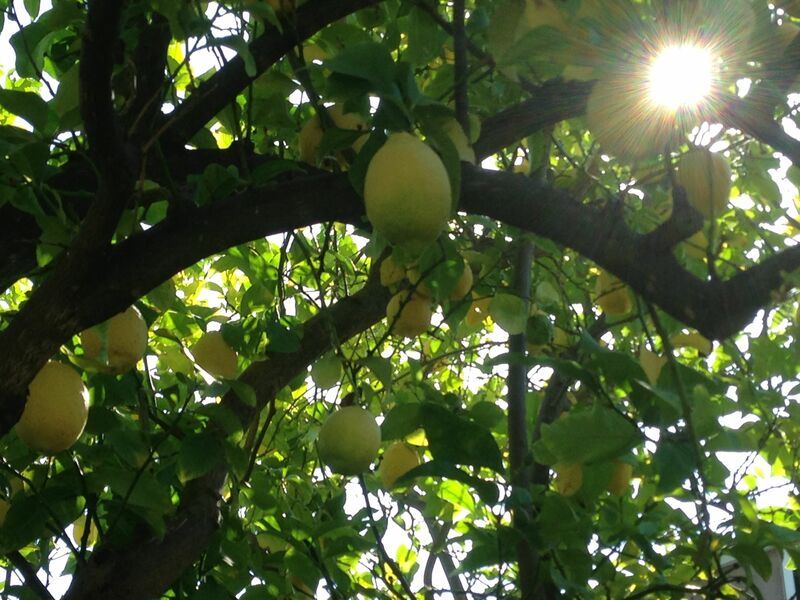 Lemons dangling like ornaments from its branches and hidden like Easter eggs amidst the foliage on the ground. Gene’s final words, spoken in the middle of the night, were to his hospital roommate. Words that seemed to come from an incoherent state but were in fact articulate. Words from a man who endured terrible disappointments, but whose heart never gave out. 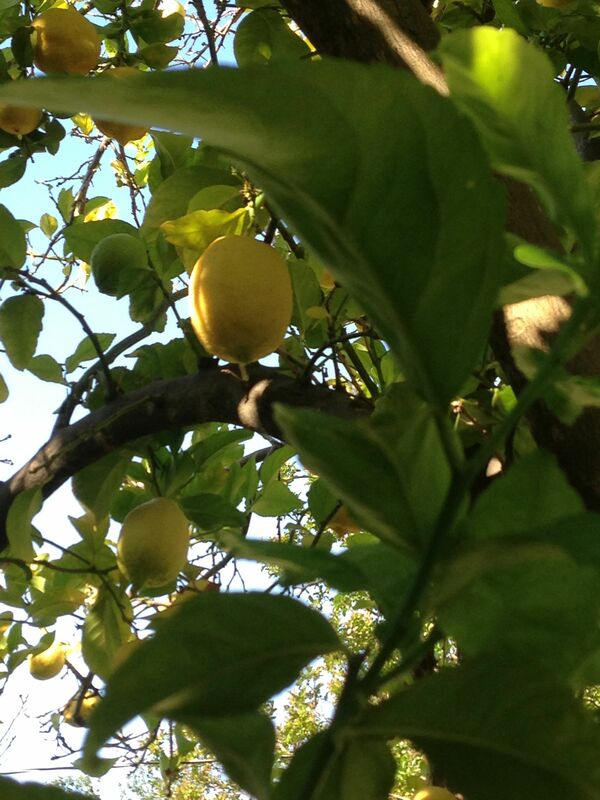 Of course it was he who planted that lemon tree. It’s his legacy. A gift that bears fruit year after year and reminds us that we can make of the fruit what we want. That’s what I learned when I returned to my Livermore. Life gives us lemons. An abundance of them. And that’s a good thing. An abundance of friends came to our farewell party, staying for our final howellelujha chorus, our howls reminding us that we are a pack of the heart. Tom and I felt well-loved. Felt we had made a difference—and I think that’s what we want in life—to feel like we make a difference. Gene’s lemon tree stays behind. Bearing fruit. Bearing witness. Gene’s legacy. His gift to our world. If life gives you lemons, be grateful. Be very grateful. Note: Our house has sold. This is the last post that I will write in my Writing Shed, the place that inspired the name for my blog. I will take this next week off. Next time I blog it will be from my new home, my next writing shed in the great Northwest. This entry was posted in Writing and tagged Faulkner, Faulkner Nobel Prize Speech, Karen Hogan, lemon tree, life gives you lemons. Bookmark the permalink. Hope to see you in your new northwest place in the not-too-distant future. Let us all continue to bear witness to the truth of life. Blessings and hugs to you, Karen, and to Tom. Enjoy the next chapter of life. Beautifully written, Karen. Good luck up north.